In response to virus infection or treatment with dsRNA, macrophages express the inducible form of cyclooxygenase-2 (COX-2) and produce proinflammatory prostaglandins. Recently, we have shown that NF-κB is required for encephalomyocarditis virus (EMCV)- and dsRNA-stimulated COX-2 expression in mouse macrophages. The dsRNA-dependent protein kinase R is not required for EMCV-stimulated COX-2 expression, suggesting the presence of protein kinase R-independent pathways in the regulation of this antiviral gene. In this study, the role of MAPK in the regulation of macrophage expression of cyclooxygenase-2 (COX)-2 in response to EMCV infection was examined. Treatment of mouse macrophages or RAW-264.7 cells with dsRNA or infection with EMCV stimulates the rapid activation of the MAPKs p38, JNK, and ERK. Inhibition of p38 and JNK activity results in attenuation while ERK inhibition does not modulate dsRNA- and EMCV-induced COX-2 expression and PGE2 production by macrophages. JNK and p38 appear to selectively regulate COX-2 expression, as inhibition of either kinase fails to prevent dsRNA- or EMCV-stimulated inducible NO synthase expression by macrophages. Using macrophages isolated from TLR3-deficient mice, we show that p38 and JNK activation and COX-2 expression in response to EMCV or poly(IC) does not require the presence the dsRNA receptor TLR3. 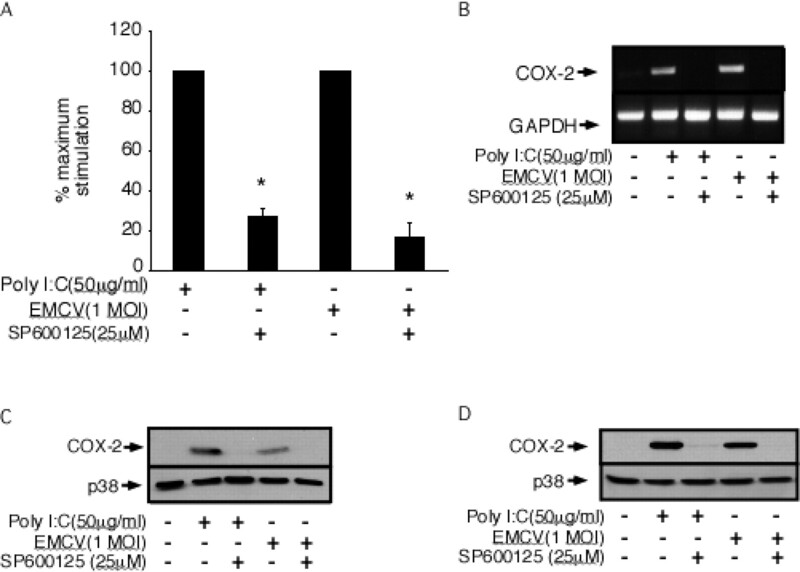 These findings support a role for p38 and JNK in the selective regulation of COX-2 expression by macrophages in response to virus infection. Virus infection of macrophages results in the activation of a number of signaling cascades that participate in the selective regulation of inflammatory genes, including cytokines such as IL-1, TNF, and IL-6, as well as inducible NO synthase (iNOS)3 and cyclooxygenase-2 (COX-2). COX catalyzes the oxidation of arachidonic acid to PGH2, which is then isomerized to biologically active eicosanoids and thromboxanes (1). Expression of COX-2 is activated in response to a wide variety of cytokines and inflammatory mediators as well as during virus infection (2, 3, 4, 5, 6, 7). One of the predominate products of COX enzymatic activity is PGE2 and increased production of this prostaglandin has been shown to modulate the replication and infectivity of a number of viruses (7). Although these findings suggest that the expression of COX-2 and the increased production of prostaglandins may play an important role in modulating viral infection, the mechanisms by which viral infection or dsRNA stimulates COX-2 expression and PGE2 production by macrophages are not well defined. The dsRNA-dependent protein kinase, protein kinase R (PKR), plays a primary role in mediating many antiviral activities of infected cells. In response to a virus infection, PKR attenuates protein translation by phosphorylating the translational initiation factor eIF2α (8). PKR also appears to participate in the regulation of inflammatory gene expression, in part, by activating NF-κB (9, 10). Although PKR plays a primary role in the regulation of inflammatory gene expression, a number of PKR-independent pathways have been identified, including the pathways that are responsible for the expression of COX-2 by macrophages in response to encephalomyocarditis virus (EMCV) infection. Using molecular and genetic approaches, we have shown that functional PKR is not required for dsRNA- and EMCV-induced COX-2 expression and PGE2 production in macrophages. NF-κB is activated in response to EMCV infection, and recent evidence suggests that its activation is required for COX-2 expression. In a PKR-independent manner, we have shown that EMCV- and dsRNA-induced COX-2 expression is sensitive to inhibitors of NF-κB activation. These findings support the presence of PKR-independent signaling cascades in the regulation of inflammatory gene expression in response to virus infection. One such pathway that is responsible for the selective regulation of iNOS expression in response to EMCV infection requires activation of the calcium-independent phospholipase A2 (iPLA2) and the downstream activation of cAMP response element-binding protein (CRE) (11, 12). Although this virus-activated signaling cascade is required for iNOS expression, it does not appear to participate in regulation of EMCV-stimulated COX-2 expression by macrophages (2, 12). In an effort to identify the PKR-independent signaling pathways that are responsible for the regulation of COX-2 expression by macrophages in response to a virus infection, we focused our attention on MAPKs (13, 14, 15). Members of the mammalian MAPK superfamily include ERK, p38, and JNK and these kinases are regulated via Tyr/Thr phosphorylation by the upstream MAPK kinases (MKKs) MEK, MKK 3/6 and MKK4/7, respectively. Once activated, the downstream targets of MAPKs include the ERK substrate MAPK-activated protein kinase-1 (MAPKAPK-1), MAPK-interacting kinases, mitogen- and stress-activated protein kinases, and the transcription factor Elk1. Substrates of p38 include MAPKAPK-2/3, mitogen- and stress-activated protein kinases, ATF2, CHOP, and Elk1 and substrates of JNK include c-Jun, JunD, ATF2, and Elk1 (13, 16). Virus infection and dsRNA have been shown to activate MAPK pathways in different cell types via PKR-dependent and -independent mechanisms and MAPK activation has been implicated in the regulation of inflammatory gene expression (17, 18, 19, 20, 21, 22, 23, 24, 25, 26, 27, 28). We have shown that dsRNA- and EMCV infection stimulates ERK activation and ERK-dependent regulation of IL-1 expression (19, 29, 30, 31). Although MAPK-signaling cascades participate in the regulation of COX-2 expression (16, 32, 33, 34, 35, 36, 37, 38, 39, 40), few studies have examined the role of MAPK in dsRNA- and EMCV-induced COX-2 expression (34). In this study, the regulatory roles of p38, JNK, and ERK, in dsRNA- and EMCV-induced COX-2 expression and PGE2 production by macrophages have been examined. We show that selective inhibition of p38 and JNK results in attenuation of dsRNA- and EMCV-induced COX-2 mRNA accumulation, protein expression, and PGE2 production in macrophages. In contrast, ERK inhibition does not modulate either dsRNA- or EMCV-stimulated COX-2 expression. The regulatory role of p38 and JNK appears to be selective for COX-2, as p38 and JNK inhibition does not affect dsRNA-induced iNOS expression by macrophages. Recently, we have shown that the EMCV capsid devoid of virus RNA is sufficient to stimulate MAPK activation and inflammatory gene expression by macrophages, suggesting that dsRNA produced during EMCV infection is not required to activate inflammatory gene expression in macrophages (41). Consistent with these findings, we now show that EMCV infection activates MAPK-signaling pathways and COX-2 expression to similar levels in macrophages isolated from wild type and mice deficient in the dsRNA receptor TLR3. 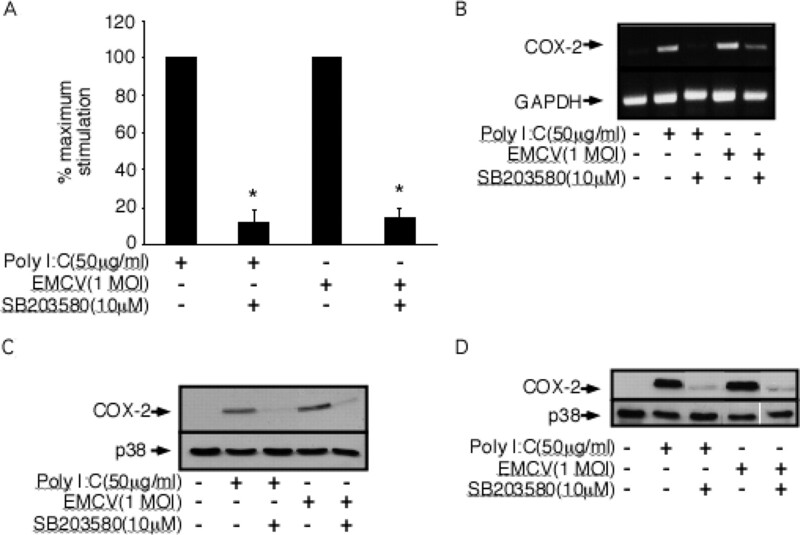 These findings support a selective role for p38 and JNK in regulating the antiviral response of COX-2 expression and that TLR3 is not required to transduce the signals emanating from the interactions of EMCV capsid with the cell surface that are responsible for the regulation of COX-2 expression by macrophages. DMEM containing 10% heat-inactivated FCS and l-glutamine was obtained from Washington University Tissue Culture Support Center (St. Louis, MO). CMRL-1066 tissue culture medium, l-glutamine, penicillin, and streptomycin were obtained from Invitrogen Life Technologies. Poly(IC) was purchased from Sigma-Aldrich and was prepared for use as previously described (42). ECL reagents were purchased from Amersham Biosciences. The pDEST26 mammalian expression vector was purchased from Stratagene. HRP-conjugated donkey anti-rabbit IgG was purchased from Jackson ImmunoResearch Laboratories. C57BL/6J mice were purchased from Harlan and wild-type and TLR3−/− mice on a B6/12981 background were purchased from The Jackson Laboratory. Rabbit anti-COX-2 antiserum was obtained from Cayman Chemical. Rabbit anti-phospho-p38, rabbit anti-phospho-JNK, and rabbit anti-phospho-ERK were obtained from Promega. Rabbit anti-phospho-c-Jun was obtained from Stressgen Biotechnologies. Rabbit anti-phospho-MAPKAPK-2 and rabbit anti-phospho-MKK3/6 antisera were obtained from Cell Signaling Technology. Rabbit anti-p38 antiserum was obtained from Santa Cruz Biotechnology. SB203580, PD98059, U0126, (L)-JNKI1, and SP600125 were all obtained from Calbiochem. All other reagents were obtained from commercially available sources. Peritoneal exudate cells (PEC) were harvested from mice by lavage as previously described (43). Following isolation, 4 × 105 cells in 400 μl of complete CMRL-1066 were incubated at 37°C under an atmosphere of 95% air 5% CO2 for 3 h. Cells were washed three times with complete CMRL-1066 to remove nonadherent cells before treating with poly(IC) or EMCV as indicated in the figure legends. RAW 264.7 cells were removed from growth flasks by treatment with 0.05% trypsin, 0.02% EDTA at 37°C. Cells were washed twice with DMEM, plated at a density of 4 × 105 cells/400 μl DMEM, and cultured for 2–3 h before initiation of experiments. The production of PGE2 by macrophages was determined on culture supernatants using a PGE2 enzyme immunosorbent assay according to the manufacturer’s specifications (Cayman Chemical). Protein samples were separated by SDS-PAGE and transferred to nitrocellulose membranes (Amersham Biosciences) under semidry transfer conditions as previously described (44, 45). Ab dilutions were 1/1000 for all primary Ab incubations and 1/7000 for all HRP-conjugated secondary Ab incubations. Ag was detected by ECL according to the manufacturer’s specifications (Amersham Biosciences). Total RNA was isolated from macrophages using the RNeasy RNA isolation kit (Qiagen). Reverse-transcription PCR analysis was performed on cDNA samples using COX-2 and GAPDH primers as previously described (42, 46). PCR products were then run on 1% agarose gels. Real-time PCR analysis was performed on cDNA samples using Quantitect SYBR Green reagent (Qiagen) and the MJ Research DNA Engine Opticon System. The comparative threshold cycle method was used to quantify the relative levels of gene expression and was normalized to the housekeeping gene GAPDH (47). Statistical comparisons were made between groups using a one-way ANOVA. Significant differences between groups (p < 0.05) were determined by Bonferroni post hoc analysis. In previous studies, we have shown that NF-κB is required for macrophage expression of COX-2 in response to either the synthetic dsRNA poly(IC) or EMCV infection. In addition, COX-2 expression under these conditions does not require the presence of functional PKR (2). 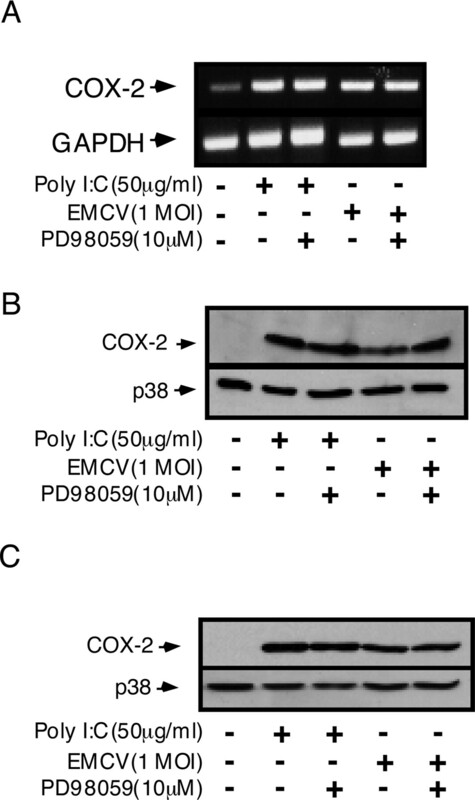 To determine whether MAPK activation participates in the regulation of COX-2 expression, we evaluated the effects of poly(IC) and EMCV on ERK, p38, and JNK phosphorylation. As shown in Fig. 1⇓, poly(IC) treatment and EMCV infection stimulates the rapid phosphorylation of all three MAPKs. The stimulatory actions of poly(IC) and EMCV on p38 phosphorylation are transient with high levels of phosphorylation 15 min posttreatment, followed by the return to basal levels of p38 phosphorylation following a 30–60 min incubation (Fig. 1⇓A). 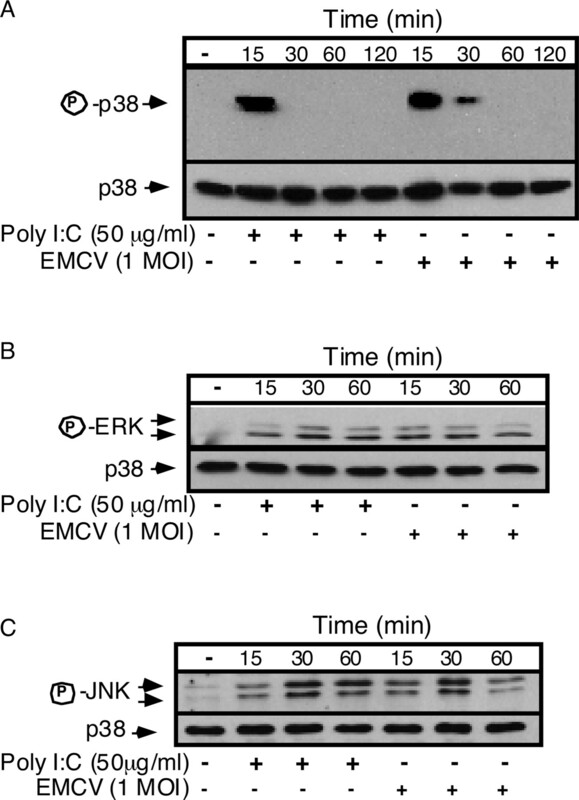 In contrast, poly(IC) and EMCV stimulate the rapid and prolonged phosphorylation of ERK and JNK in macrophages that is first detected following a 15-min incubation and that persists for up to 60 min (Fig. 1⇓, B and C). Similar to RAW 264.7 cells, poly(IC) and EMCV stimulate the rapid and prolonged phosphorylation of ERK and JNK and the rapid and transient phosphorylation of p38 in mouse PEC (data not shown). Effects of virus infection on MAPK phosphorylation. RAW 264.7 cells (4 × 105 cells/400 μl DMEM) were treated with poly(IC) (50 μg/ml) or infected with EMCV (1 multiplicity of infection (MOI)) for various time periods at 37°C as indicated. The cells were then isolated and the levels of phosphorylated p38 (A), JNK (B), and ERK (C) were determined by Western blot analysis. Total p38 levels were determined and are shown as a loading control. Results are representative of three independent experiments. To examine the role of p38 in the regulation of COX-2 expression, RAW 264.7 cells and mouse PEC were preincubated with the p38 selective inhibitor SB203580 for 30 min, the cells were then treated with poly(IC) or infected with EMCV and COX-2 mRNA accumulation following a 4-h incubation and COX-2 protein accumulation following a 24-h incubation were examined. As shown in Fig. 2⇓, A and B, SB203580 (10 μM) attenuates dsRNA- and EMCV-induced COX-2 mRNA accumulation by >80% as determined by real-time PCR (Fig. 2⇓A) as well as RT- PCR followed by agarose gel electrophoresis (Fig. 2⇓B). Consistent with the inhibitory effects on COX-2 mRNA accumulation, SB203580 also inhibits dsRNA- and EMCV-induced COX-2 protein expression by RAW 264.7 (Fig. 2⇓C) and mouse PEC (Fig. 2⇓D). These findings suggest that selective inhibition of p38 attenuates the stimulatory actions of dsRNA and EMCV infection on COX-2 expression by macrophages. Effects of p38 inhibition on dsRNA and virus-induced COX-2 expression by macrophages. RAW 264.7 cells (A–C) or mouse PEC (D) were preincubated for 30 min with the p38 inhibitor SB203580 (10 μM), poly(IC) (50 μg/ml), or EMCV (1 MOI) were added and the cells were cultured for 4 h (A and B) or 24 h (C and D). Following a 4-h incubation, total RNA was isolated from the cells and used to examine COX-2 mRNA accumulation by real-time RT-PCR analysis (A) and RT-PCR followed by agarose gel electrophoresis (B). For real-time PCR analysis, the levels of mRNA that accumulate in response to poly(IC) or EMCV were set at 100%. Following a 24-h incubation, RAW 264.7 cells (C) or mouse PEC (D) were harvested and COX-2 protein expression was determined by Western blot analysis of the cell lysates. Total p38 levels were determined and are shown as a loading control. Results for mRNA accumulation are the average ± SEM of three independent experiments (A), and results for COX-2 mRNA accumulation (B) protein expression (C and D) are representative of three independent experiments. Statistically significantly inhibition of dsRNA- or EMCV-induced COX-2 expression; ∗, p ≤ 0.05. Using a similar experimental strategy, the effects of the JNK inhibitor, SP600125, on virus-induced COX-2 expression was examined. Treatment of RAW 264.7 cells or PEC with poly(IC) or infection with EMCV results in COX-2 mRNA accumulation following a 4-h incubation protein expression following a 24-h incubation (Fig. 3⇓). Pretreatment of RAW 264.7 cells or PEC for 30 min with the JNK selective inhibitor SP600125 (25 μM) results in ∼70% inhibition of COX-2 mRNA accumulation as determined by real-time PCR (Fig. 3⇓A) and RT-PCR followed by agarose gel electrophoresis (Fig. 3⇓B). Similar results were obtained using mouse PEC (data not shown). Consistent with the inhibition of COX-2 mRNA accumulation, SB600125 also attenuates dsRNA- and EMCV-induced COX-2 protein expression by RAW 264.7 cells (Fig. 3⇓C) and mouse PEC (Fig. 3⇓D) as determined by Western blot analysis. Similar results were obtained with a second inhibitor of JNK, (L)-JNKI1 (data not shown). In agreement with our previous studies showing that PKR is not required for EMCV-stimulated COX-2 expression (2), inhibitors of p38 and JNK attenuate EMCV- and dsRNA-stimulated COX-2 expression by RAW 264.7 macrophages expressing a dominant-negative PKR mutant and PEC isolated from PKR−/− mice (data not shown). These findings support a role for both JNK and p38 in the PKR-independent regulation of COX-2 expression by macrophages in response to a virus infection. Effects of JNK inhibition on dsRNA and virus-induced COX-2 expression by macrophages. RAW 264.7 cells (A–C) or mouse PEC (D) were preincubated for 30 min with the JNK inhibitor SP600125 (25 μM), poly(IC) (50 μg/ml), or EMCV (1 MOI) were added and the cells were cultured for 4 h (A and B) or 24 h (C and D). Following a 4-h incubation, total RNA was isolated from the cells and used to examine COX-2 mRNA accumulation by real-time RT-PCR analysis (A) and RT-PCR followed by agarose gel electrophoresis (B). For real-time PCR analysis, the levels of mRNA that accumulate in response to poly(IC) or EMCV were set at 100%. Following a 24-h incubation, RAW 264.7 cells (C) or mouse PEC (D) were harvested and COX-2 protein expression was determined by Western blot analysis of the cell lysates. Total p38 levels were determined and are shown as a loading control. Results for mRNA are the average ± SEM of three independent experiments (A), and results for COX-2 mRNA accumulation (B) protein expression (C and D) are representative of three independent experiments. Statistically significantly inhibition of dsRNA- or EMCV-induced COX-2 expression; ∗, p ≤ 0.05. The role of ERK in the regulation of dsRNA- and EMCV-induced COX-2 expression was examined using the selective MEK inhibitor, PD98059. In contrast to the inhibitory actions of p38 and JNK inhibition, the MEK inhibitor, PD98059 (10 μM), does not attenuate dsRNA- or EMCV-stimulated COX-2 mRNA accumulation by RAW 264.7 cells (Fig. 4⇓A) or COX-2 protein expression by RAW 264.7 cells (Fig. 4⇓B) or mouse PEC (Fig. 4⇓C). Similar results were observed with a second MEK selective inhibitor, U1026 (data not shown). In previous studies, we have shown that the MEK inhibitors PD98059 and U0126 do not attenuate p38 or JNK activation (19), providing evidence that the actions of PD98059 are selective for MEK-ERK signaling. Although dsRNA and EMCV stimulate ERK activation, these findings suggest that ERK does not participate in the regulation of COX-2 expression by macrophages. Effect of MEK inhibition on dsRNA and virus-induced COX-2 expression by macrophages. RAW 264.7 cells (A and B) or mouse PEC (C) were preincubated for 30 min with the MEK inhibitor PD98059 (10 μM), poly(IC) (50 μg/ml), or EMCV (1 MOI) were added and the cells were cultured for 4 h (A) or 24 h (B and C). Following a 4-h incubation, total RNA was isolated from the cells and used to examine COX-2 mRNA accumulation by RT-PCR followed by agarose gel electrophoresis (A). Following a 24-h incubation, RAW 264.7 cells (B) or mouse PEC (C) were harvested and COX-2 protein expression was determined by Western blot analysis of the cell lysates. Total p38 levels were determined and are shown as a loading control. Results for COX-2 mRNA accumulation (A) and protein expression (B and C) are representative of three independent experiments. Consistent with the inhibition of COX-2 expression, a 30-min pretreatment of RAW 264.7 macrophages with the p38 and JNK inhibitors, SB203580 or SP600125, respectively, results in an ∼85–90% reduction in macrophage production of PGE2 in response to EMCV infection. In contrast, selective inhibition of ERK using the PD98059 fails to attenuate EMCV-stimulated PGE2 production by macrophages (Fig. 5⇓). In a similar manner, selective inhibition of JNK and p38 results in an attenuation of EMCV-stimulated PGE2 accumulation by mouse PEC, while ERK inhibition fails to inhibit PGE2 accumulation (data not shown). These findings provide additional evidence in support of a role for p38 and JNK in the regulation of COX-2 expression and PGE2 production by mouse macrophages in response to a virus infection. Effect of MAPK inhibition on PGE2 production by macrophages. RAW 264.7 cells (4 × 105 cells/400 μl DMEM) were preincubated for 30 min with the p38 inhibitor SB203580 (10 μM), the JNK inhibitor SP600125 (25 μM), or the MEK inhibitor PD98059 (10 μM), before infection with EMCV (1 MOI). At 24 h post-EMCV infection, the culture supernatants were harvested and PGE2 production was determined by ELISA. Results are the average ± SEM of three independent experiments. Statistically significant inhibition of EMCV-induced PGE2 production; ∗, p < 0.05. To confirm that the selective inhibitors of p38 and JNK attenuate the activity of each kinase, the effects of these inhibitors on the phosphorylation of downstream targets were examined. As shown in Fig. 6⇓, EMCV infection or treatment with dsRNA stimulates the rapid phosphorylation of the p38 substrate, MAPKAPK2. 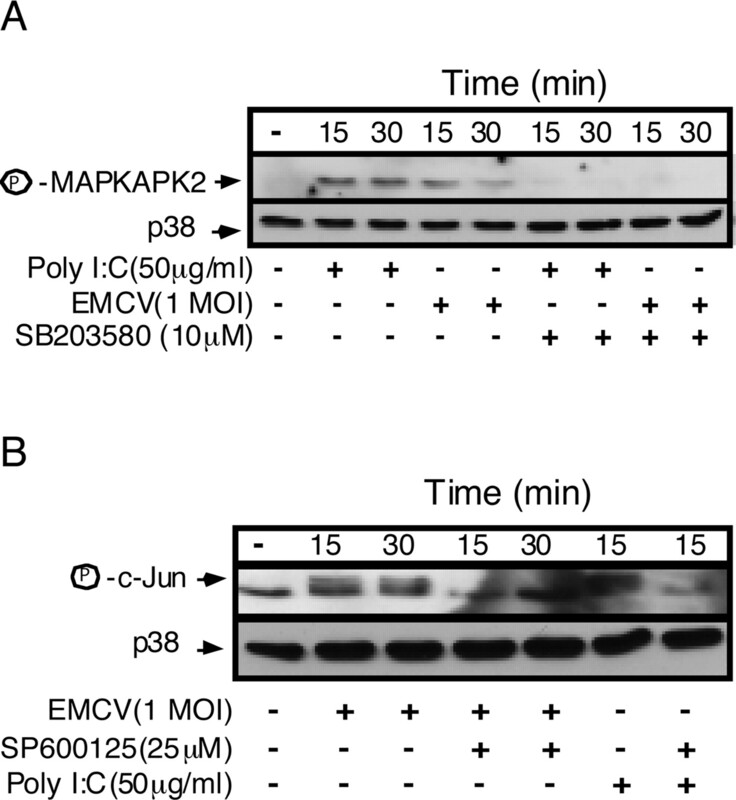 In macrophages pretreated for 30 min with the p38 selective inhibitor SB203580, poly(IC)- and EMCV-induced MAPKAPK2 phosphorylation is attenuated (Fig. 6⇓A). In a similar manner, the JNK selective inhibitor SP600125 prevents poly(IC)- and EMCV-induced phosphorylation of the JNK substrate c-Jun (Fig. 6⇓B, slower migrating band). These findings indicate that selective inhibition of JNK and p38 results in attenuation in the phosphorylation of downstream targets, c-Jun and MAPKAPK2, respectively. The effects of each inhibitor appear to be selective for the target pathway, as the JNK inhibitor SP600125 fails to prevent EMCV- or dsRNA-stimulated MAPKAP2 phosphorylation and the p38 inhibitor SB203580 does not inhibit c-Jun phosphorylation (data not shown). Effect of dsRNA and EMCV treatment on activation of downstream MAPK targets in macrophages. RAW 264.7 cells (4 × 105 cells/400 μl DMEM) were preincubated for 30 min with the p38 inhibitor SB203580 (10 μM), or the JNK inhibitor SP600125 (25 μM), poly(IC) (50 μg/ml), or EMCV (1 MOI) were added and the cells were cultured for 15 or 30 additional min as indicated. The cells were harvested and phosphorylation of the p38 substrate MAPKAPK2 (A) and the JNK substrate c-Jun (B) was determined by Western blot analysis on the cell lysates. Total p38 levels were determined and are shown as a loading control. Results are representative of three independent experiments. To determine the specificity of the signaling cascades that regulate inflammatory gene expression in response to a virus infection in macrophages, we examined the effects of p38 and JNK inhibition on iNOS expression in response to EMCV infection or treatment with dsRNA. We have recently shown that dsRNA- and EMCV-stimulated iNOS expression requires the activation of iPLA2 (12), and that this pathway appears to be selective for iNOS, as inhibition of iPLA2 does not modulate virus-induced COX-2 expression by macrophages (2). Consistent with selectivity in the regulation of inflammatory gene expression, inhibition of p38 and JNK fails to attenuate dsRNA- or EMCV-stimulated iNOS expression by RAW 264.7 cells (Fig. 7⇓). These findings suggest that EMCV and dsRNA activate an array of signaling cascades, and that specific cascades are responsible for the selective regulation of individual target genes. In this case, p38 and JNK participate in the regulation of COX-2, while iPLA2 participates in the regulation of iNOS. Effects of p38 and JNK inhibition on iNOS expression by macrophages. RAW 264.7 cells were preincubated for 30 min with the p38 inhibitor SB203580 (10 μM, A) or the JNK inhibitor SP600125 (25 μM, B); EMCV (1 MOI) was added and the cells were cultured for 24 h. Cells were harvested and iNOS protein expression was determined by Western blot analysis of the cell lysates. Total p38 levels were determined and are shown as a loading control. Results are representative of three independent experiments. In an effort to gain insights into the mechanisms regulating EMCV- and poly(IC)-stimulated COX-2 expression by macrophages, we explored the potential role of TLR3 using mice deficient in this dsRNA receptor. We chose to explore TLR3 as a potential signaling pathway as macrophages deficient in TLR3 display defects in their response to poly(IC), including attenuation in the activation of NF-κB and the release of the inflammatory cytokines such as IL-6 and TNF (20). Treatment of macrophages isolated from wild-type and TLR3−/− mice with poly(IC) or infection with EMCV results in the expression of COX-2 to similar levels (Fig. 8⇓A). These studies were extended to examine the role of TLR3 in the regulation of iNOS expression and NO production. In contrast to RAW 264.7 cells, primary mouse macrophages require a combination of two inflammatory signals such as a combination of IFN-γ and EMCV or IFN-γ and poly(IC) to produce NO and express iNOS (42, 48). Importantly, macrophages isolated from TLR3−/− mice produce nitrite to levels that are similar in magnitude to the levels produced by macrophages isolated from wild-type mice (Fig. 8⇓B). Consistent with the generation of NO, iNOS is expressed to similar levels in macrophages isolated from wild-type and TLR3−/− mice in response to either poly(IC) + IFN-γ or EMCV + IFN-γ, as determined by Western blot analysis (data not shown). 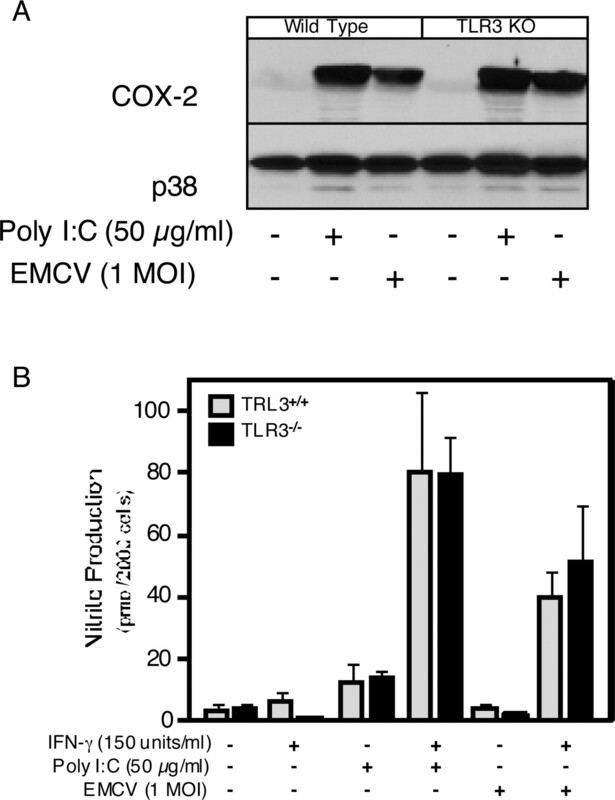 TLR3 is not required for EMCV-stimulated COX-2 expression or NO production by macrophages. Naive macrophages, isolated from the peritoneum of wild-type and TLR3−/− mice, were infected with EMCV or treated with poly(IC) for 24 h. The cells were harvested and COX-2 expression was examined by Western blot analysis (A). The levels of total p38 were determined as a loading control. B, Mouse PEC isolated from wild-type and TLR3−/− mice were treated with poly(IC), EMCV, and IFN-γ for 24 h as indicated, the supernatant was harvested and nitrite production was determined. Results are representative (A) or the average ± SEM (B) of three independent experiments. One target of TLR3 signaling is the activation of the MAPK cascade (49), and we show in this study that the MAPKs p38 and JNK participate in the regulation of EMCV-stimulated COX-2 expression by macrophages. Therefore, the effects of TLR3 deficiency on the activation of ERK, p38, and JNK were examined by Western blot analysis using Abs specific for the phosphorylated form of each kinase. As shown in Fig. 9⇓, infection of macrophages isolated from wild-type and TLR3−/− mice with EMCV results in the rapid phosphorylation of p38, ERK, and JNK. Similar results were obtained with poly(IC)-treated macrophages (data not shown). Overall, these findings suggest that engagement of the TLR3 dsRNA receptor is not required for the activation of MAPK signaling or the stimulation of COX-2 and iNOS (in the presence of IFN-γ) by macrophages treated with poly(IC) or infected with EMCV. 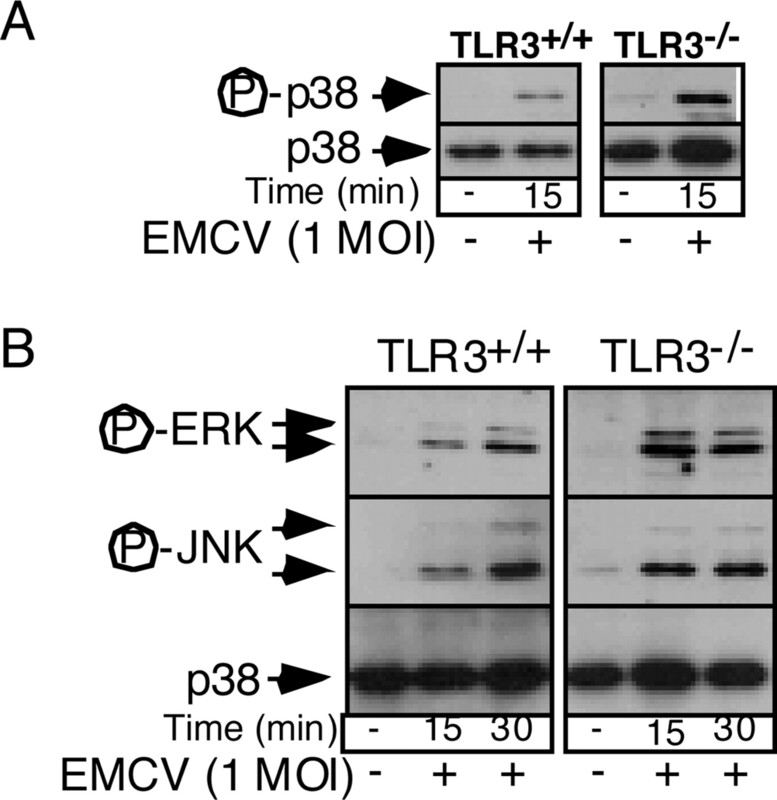 TLR3 is not required for EMCV-stimulated MAPK signaling in macrophages. Naive macrophages, isolated from the peritoneum of wild-type and TLR3−/− mice, were infected with EMCV for 15 or 30 min as indicated. The cells were harvested and the levels of phosphorylated p38 (A), JNK, and ERK (B) were determined using phosphospecific Abs for each kinase. Total p38 levels are shown as a loading control. Results are representative of three independent experiments. PKR is believed to be a primary mediator of antiviral activities within infected cells due to its ability to recognize and to mobilize a response to the accumulation of dsRNA formed during a viral infection. dsRNA has been shown to activate two opposing antiviral strategies, either a cell death pathway (apoptosis) or a survival pathway characterized by the expression of proinflammatory genes including iNOS, COX-2, and cytokines such as IFNs and interleukins (50). In a number of cell types, evidence supports a role for PKR in the regulation of NF-κB, MAPK signaling, and inflammatory gene expression in response to virus infection (51, 52). Although NF-κB has been shown to be one downstream target of PKR that participates in the regulation of gene expression (9, 53), a number of PKR-independent antiviral activities have been identified. In mouse peritoneal macrophages deficient in functional PKR and macrophage-derived cell lines stably expressing dominant-negative mutants of PKR, EMCV stimulates iNOS, IL-1, and COX-2 expression to levels similar to wild-type controls (2, 12, 19). Islets of Langerhans isolated from wild-type and PKR−/− mice express iNOS and produce NO to similar levels in response to dsRNA + IFN-γ (54). In addition, EMCV infection stimulates NF-κB activation to similar levels in wild-type and PKR−/− mouse embryonic fibroblasts (50). These findings support the presence of both PKR-dependent and PKR-independent pathways in the regulation of inflammatory gene expression in response to virus infection, and that the PKR requirement may be selective for specific cell types and viruses. In addition to the NF-κB, the COX-2 promoter contains consensus elements for the binding of MAPK-activated transcription factors CRE, AP2, SP1, and NF-IL-6 (34). In previous studies, we have reported that EMCV and dsRNA stimulate macrophage expression of COX-2 by a pathway that is sensitive to inhibitors of NF-κB activation (proteosome inhibitors) and overexpression of the IκB super-repressor and that does not require the presence of functional PKR (2). In this report, a role for p38 and JNK in the regulation of macrophage expression of COX-2 in response to EMCV infection and dsRNA treatment has been identified. 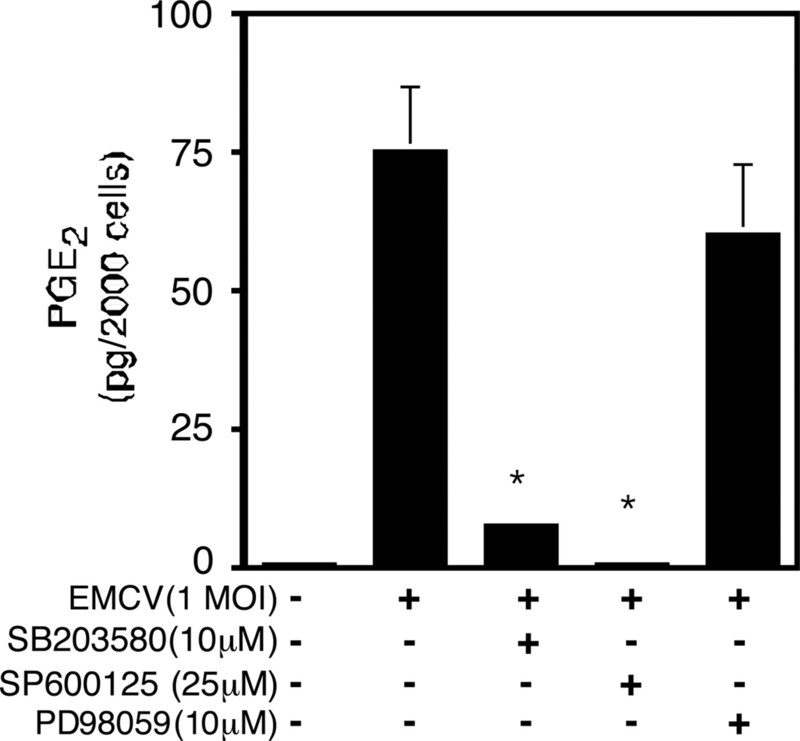 Treatment of mouse macrophages and RAW 264.7 cells with poly(IC) or infection with EMCV stimulates the rapid activation of the ERK, JNK, and p38. Inhibition of p38 and JNK activity attenuates EMCV- and dsRNA-stimulated COX-2 mRNA accumulation, protein expression, and PGE2 production by mouse macrophages. Inhibition of ERK activity using the upstream MEK inhibitor fails to attenuate the stimulatory actions of dsRNA and EMCV on COX-2 expression by mouse macrophages. Although virus infection activates each of these MAPKs, signaling through the JNK and p38 pathways, but not the ERK pathway, appears to contribute to the stimulatory actions of EMCV infection on macrophage COX-2 expression. These findings are consistent with previous reports supporting a role for p38 and JNK in the regulation of COX-2 expression stimulated by LPS and cytokines (16, 36). The regulation of macrophage inflammatory gene expression in response to virus expression appears to be selective in that specific signaling cascades regulate the expression of specific inflammatory mediators. Evidence supports a role for NF-κB as a primary regulator of inflammatory gene expression. NF-κB is a transcription factor well-known for its roles in the regulation of proinflammatory cytokines (IL-1, IL-6, TNF), iNOS, and COX-2 expression. Alone, NF-κB does not appear to be sufficient to regulate the expression of these target genes. For each target gene, additional pathways are required for transcriptional activation in response to virus infection. In this report, we have identified a role for p38 and JNK as additional pathways that participate with NF-κB (2) in the regulation of macrophage COX-2 expression in response to EMCV infection or treatment with dsRNA. Importantly, inhibitors of p38 and JNK do not affect EMCV- or dsRNA-stimulated iNOS expression by macrophages. In addition to NF-κB, iNOS expression in response to EMCV infection requires the activation of iPLA2 and the downstream activation of CREB in a protein kinase A-dependent manner (12). Similarly, ERK inhibition does not modulate COX-2 (as shown in this study) or iNOS expression (19); however, inhibitors of ERK (both chemical and molecular) attenuate dsRNA- and EMCV-stimulated IL-1 expression by mouse macrophages (19). Overall, this evidence suggests that NF-κB is the primary regulator of inflammatory gene expression, and that the additional pathways of iPLA2, ERK, and p38/JNK participate in the selective regulation of iNOS, IL-1, and COX-2, respectively, by macrophages in response to EMCV infection (2, 12, 19). The ability of poly(IC) and EMCV infection to activate a wide array of signaling cascades, each of which selectively regulates a target inflammatory gene suggests that the receptor responsible for this activation must have a number of intracellular targets. TLR3 is one potential receptor that is responsive to dsRNA and has been shown to regulate NF-κB and MAPK kinase activation (49, 55). Because poly(IC) and EMCV-induced COX-2 expression is dependent on the activation of NF-κB (2, 19, 42) and p38/JNK signaling (this study), and TLR3 is a dsRNA receptor (20), the role of TLR3 in the regulation of COX-2 expression was examined using macrophages isolated from TLR3-deficient mice. EMCV infection or treatment with dsRNA results in the expression of COX-2 to similar levels in wild-type and TLR3-deficient macrophages. 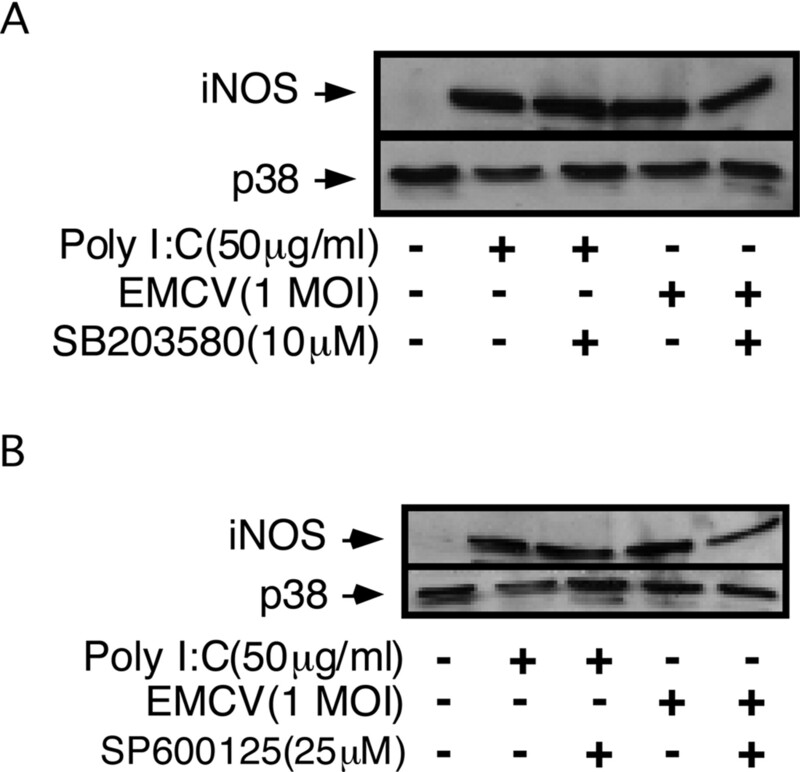 In addition, the presence of TLR3 does not appear to be required for macrophage expression of iNOS and production of NO in response to poly(IC) or EMCV. Consistent with the lack of an inhibition of COX-2 expression or NO production, the absence of TLR3 had no effect on the ability of EMCV to stimulate ERK, JNK, or p38 phosphorylation. These findings suggest that the presence of functional TLR3 is not required for the expression of the inflammatory genes iNOS and COX-2 by macrophages in response to EMCV infection or dsRNA. Importantly, these findings are consistent with the recently described endosomal localization of this dsRNA receptor (56, 57). Currently, the identity of the receptor(s) that activates each of these signaling pathways following EMCV infection remains elusive. Recently, a number of cytoplasmic dsRNA sensing pattern-recognition receptors have been described. These include retinoic acid inducible gene (RIG-I; Ref. 58), mitochondrial antiviral signaling (MAVS; Ref. 59) and melanoma differentiation-associated gene-5 (mda-5; Refs. 60 and 61) which have been shown to regulate the transcriptional activation of type 1 IFNs through a mechanism involving the activation of NF-κB and IFN regulatory factor 3 (62). RIG-I appears to contribute to the regulation of IFN expression by a pathway that is both complementary and parallel to TLR3 because the downstream activation of RIG-I signaling components such as MAVS is not required for IFN induction by TLR ligands (63). Consequently, it is likely that TLRs and RIG-I exist as parallel antiviral pathways responsible for detecting viral RNA in topologically distinct regions of the cell. Of interest is the potential role for mda-5 as a regulator of macrophage responses to EMCV. Recent studies have shown that poly(IC)- and EMCV-stimulated type 1 IFN and inflammatory cytokine production (IL-6, TNF, and MCP-1) are attenuated in macrophages isolated from mda-5-deficient mice as compared with wild-type controls (60). In addition, the regulatory actions of mda-5 may be selective for EMCV infection, as mda-5 deficiency does not appear to modulate IFN-α secretion from bone marrow-derived macrophages and dendritic cells in response to infection by a number of RNA and DNA viruses including West Nile, reovirus, Sindbis virus, murine CMV, and HSV-1 (60). Alternatively, dsRNA pattern-recognition receptors may not participate in the mechanisms by which EMCV infection stimulates expression of proinflammatory genes by macrophages. Recently, we have shown that the EMCV capsid devoid of RNA is capable of activating iNOS expression, and the MAPK- and NF-κB-signaling pathways (41). These findings suggest that the EMCV capsid protein may activate signaling pathways resulting in inflammatory gene expression by a mechanism that is not dependent on the production of dsRNA or the activation of a dsRNA sensor. In support of this possible mechanism, previous studies have shown that TLR2 and TLR4 can be activated by protein components of CMV and measles virus (64, 65, 66). In conclusion, we have shown that functional dsRNA-dependent protein kinase PKR (2) and TLR3 (current study) are not required for COX-2 expression in macrophages treated with dsRNA or infected with EMCV. These findings strongly suggest the presence of additional receptors capable of recognizing either the accumulation of foreign dsRNA within the cell or EMCV capsid protein on the cell surface that may participate in the regulation of proinflammatory and antiviral gene expression in macrophages. Currently, we are examining the roles of cytoplasmic dsRNA receptors such as RIG-I, MAVS, and mda-5 as well as additional macrophage surface signaling receptors in the regulation of inflammatory gene expression by virus-infected macrophages. We thank Colleen Kelly Bratcher for expert technical assistance, Ji-Won Yoon for the gift of EMCV, and Dr. Mark Buller for insightful discussions related to these ongoing studies. ↵1 This work was supported by National Institutes of Health Grants DK52194 and AI44458 (to J.A.C.). S.A.S. was supported by an American Heart Association predoctoral fellowship award. ↵3 Abbreviations used in this paper: iNOS, inducible NO synthase; COX-2, cyclooxygenase-2; PKR, protein kinase R; EMCV, encephalomyocarditis virus; iPLA2, independent phospholipase A2; MKK, MAPK kinase; MAPKAPK-1, MAPK-activated protein kinase-1; PEC, peritoneal exudate cell; RIG-I, retinoic acid inducible gene; MAVS, mitochondrial antiviral signaling; mda-5, melanoma differentiation-associated gene-5; CRE, cAMP response element-binding protein. Dubois, R. N.. 2000. Review article: cyclooxygenase–a target for colon cancer prevention. Aliment. Pharmacol. Ther. 14: (Suppl. 1):64-67. Steer, S. A., J. M. Moran, L. B. Maggi, Jr, R. M. Buller, H. Perlman, J. A. Corbett. 2003. Regulation of cyclooxygenase-2 expression by macrophages in response to double-stranded RNA and viral infection. J. Immunol. 170: 1070-1076. Smith, W. L., R. Langenbach. 2001. Why there are two cyclooxygenase isozymes. J. Clin. Invest. 107: 1491-1495. Rossen, J. W., J. Bouma, R. H. Raatgeep, H. A. Buller, A. W. Einerhand. 2004. Inhibition of cyclooxygenase activity reduces rotavirus infection at a postbinding step. J. Virol. 78: 9721-9730. Symensma, T. L., D. Martinez-Guzman, Q. Jia, E. Bortz, T. T. Wu, N. Rudra-Ganguly, S. Cole, H. Herschman, R. Sun. 2003. COX-2 induction during murine γherpesvirus 68 infection leads to enhancement of viral gene expression. J. Virol. 77: 12753-12763. Mizumura, K., S. Hashimoto, S. Maruoka, Y. Gon, N. Kitamura, K. Matsumoto, S. Hayashi, K. Shimizu, T. Horie. 2003. Role of mitogen-activated protein kinases in influenza virus induction of prostaglandin E2 from arachidonic acid in bronchial epithelial cells. Clin. Exp. Allergy 33: 1244-1251. Steer, S. A., J. A. Corbett. 2003. The role and regulation of COX-2 during viral infection. Viral Immunol. 16: 447-460. Wu, S., R. J. Kaufman. 1997. A model for the double-stranded RNA (dsRNA)-dependent dimerization and activation of the dsRNA-activated protein kinase PKR. J. Biol. Chem. 272: 1291-1296. Kumar, A., J. Haque, J. Lacoste, J. Hiscott, B. R. Williams. 1994. Double-stranded RNA-dependent protein kinase activates transcription factor NF-κB by phosphorylating IκB. Proc. Natl. Acad. Sci. USA 91: 6288-6292. Gale, M., Jr, M. G. Katze. 1998. Molecular mechanisms of interferon resistance mediated by viral-directed inhibition of PKR, the interferon-induced protein kinase. Pharmacol. Ther. 78: 29-46. Moran, J. M., R. M. Buller, J. McHowat, J. Turk, M. Wohltmann, R. W. Gross, J. A. Corbett. 2005. Genetic and pharmacologic evidence that calcium-independent phospholipase A2β regulates virus-induced inducible nitric-oxide synthase expression by macrophages. J. Biol. Chem. 280: 28162-28168. Maggi, L. B., Jr, J. M. Moran, A. L. Scarim, D. A. Ford, J. W. Yoon, J. McHowat, R. M. Buller, J. A. Corbett. 2002. Novel role for calcium-independent phospholipase A2 in the macrophage antiviral response of inducible nitric-oxide synthase expression. J. Biol. Chem. 277: 38449-38455. Kyriakis, J. M., J. Avruch. 2001. Mammalian mitogen-activated protein kinase signal transduction pathways activated by stress and inflammation. Physiol. Rev. 81: 807-869. Ichijo, H.. 1999. From receptors to stress-activated MAP kinases. Oncogene 18: 6087-6093. Force, T., J. V. Bonventre. 1998. Growth factors and mitogen-activated protein kinases. Hypertension 31: 152-161. Dean, J. L., M. Brook, A. R. Clark, J. Saklatvala. 1999. p38 mitogen-activated protein kinase regulates cyclooxygenase-2 mRNA stability and transcription in lipopolysaccharide-treated human monocytes. J. Biol. Chem. 274: 264-269. Iordanov, M. S., J. M. Paranjape, A. Zhou, J. Wong, B. R. Williams, E. F. Meurs, R. H. Silverman, B. E. Magun. 2000. Activation of p38 mitogen-activated protein kinase and c-Jun NH2-terminal kinase by double-stranded RNA and encephalomyocarditis virus: involvement of RNase L, protein kinase R, and alternative pathways. Mol. Cell. Biol. 20: 617-627. Tadlock, L., Y. Yamagiwa, C. Marienfeld, T. Patel. 2003. Double-stranded RNA activates a p38 MAPK-dependent cell survival program in biliary epithelia. Am. J. Physiol. 284: G924-G932. Maggi, L. B., Jr, J. M. Moran, R. M. Buller, J. A. Corbett. 2003. ERK activation is required for double-stranded RNA- and virus-induced interleukin-1 expression by macrophages. J. Biol. Chem. 278: 16683-16689. Auch, C. J., R. N. Saha, F. G. Sheikh, X. Liu, B. L. Jacobs, K. Pahan. 2004. Role of protein kinase R in double-stranded RNA-induced expression of nitric oxide synthase in human astroglia. FEBS Lett. 563: 223-228. Meusel, T. R., F. Imani. 2003. Viral induction of inflammatory cytokines in human epithelial cells follows a p38 mitogen-activated protein kinase-dependent but NF-κB-independent pathway. J. Immunol. 171: 3768-3774. Gern, J. E., D. A. French, K. A. Grindle, R. A. Brockman-Schneider, S. Konno, W. W. Busse. 2003. Double-stranded RNA induces the synthesis of specific chemokines by bronchial epithelial cells. Am. J. Respir. Cell Mol. Biol. 28: 731-737. Pisegna, S., G. Pirozzi, M. Piccoli, L. Frati, A. Santoni, G. Palmieri. 2004. p38 MAPK activation controls the TLR3-mediated upregulation of cytotoxicity and cytokine production in human NK cells. Blood 104: 4157-4164. Hirasawa, K., H. S. Jun, H. S. Han, M. L. Zhang, M. D. Hollenberg, J. W. Yoon. 1999. Prevention of encephalomyocarditis virus-induced diabetes in mice by inhibition of the tyrosine kinase signalling pathway and subsequent suppression of nitric oxide production in macrophages. J. Virol. 73: 8541-8548. Hirasawa, K., A. Kim, H. S. Han, J. Han, H. S. Jun, J. W. Yoon. 2003. Effect of p38 mitogen-activated protein kinase on the replication of encephalomyocarditis virus. J. Virol. 77: 5649-5656. Mizutani, T., S. Fukushi, M. Saijo, I. Kurane, S. Morikawa. 2004. Phosphorylation of p38 MAPK and its downstream targets in SARS coronavirus-infected cells. Biochem. Biophys. Res. Commun. 319: 1228-1234. Andrade, A. A., P. N. Silva, A. C. Pereira, L. P. De Sousa, P. C. Ferreira, R. T. Gazzinelli, E. G. Kroon, C. Ropert, C. A. Bonjardim. 2004. The vaccinia virus-stimulated mitogen-activated protein kinase (MAPK) pathway is required for virus multiplication. Biochem. J. 381: 437-446. Pahan, K., F. G. Sheikh, A. M. Namboodiri, I. Singh. 1998. Inhibitors of protein phosphatase 1 and 2A differentially regulate the expression of inducible nitric-oxide synthase in rat astrocytes and macrophages. J. Biol. Chem. 273: 12219-12226. Da Silva, J., B. Pierrat, J. L. Mary, W. Lesslauer. 1997. Blockade of p38 mitogen-activated protein kinase pathway inhibits inducible nitric-oxide synthase expression in mouse astrocytes. J. Biol. Chem. 272: 28373-28380. Chan, E. D., B. W. Winston, S. T. Uh, M. W. Wynes, D. M. Rose, D. W. Riches. 1999. Evaluation of the role of mitogen-activated protein kinases in the expression of inducible nitric oxide synthase by IFN-γ and TNF-α in mouse macrophages. J. Immunol. 162: 415-422. Mestre, J. R., P. J. Mackrell, D. E. Rivadeneira, P. P. Stapleton, T. Tanabe, J. M. Daly. 2001. Redundancy in the signaling pathways and promoter elements regulating cyclooxygenase-2 gene expression in endotoxin-treated macrophage/monocytic cells. J. Biol. Chem. 276: 3977-3982. Reddy, S. T., D. J. Wadleigh, H. R. Herschman. 2000. Transcriptional regulation of the cyclooxygenase-2 gene in activated mast cells. J. Biol. Chem. 275: 3107-3113. Hwang, D., B. C. Jang, G. Yu, M. Boudreau. 1997. Expression of mitogen-inducible cyclooxygenase induced by lipopolysaccharide: mediation through both mitogen-activated protein kinase and NF-κB signaling pathways in macrophages. Biochem. Pharmacol. 54: 87-96. Hunot, S., M. Vila, P. Teismann, R. J. Davis, E. C. Hirsch, S. Przedborski, P. Rakic, R. A. Flavell. 2004. JNK-mediated induction of cyclooxygenase 2 is required for neurodegeneration in a mouse model of Parkinson’s disease. Proc. Natl. Acad. Sci. USA 101: 665-670. Degousee, N., J. Martindale, E. Stefanski, M. Cieslak, T. F. Lindsay, J. E. Fish, P. A. Marsden, D. J. Thuerauf, C. C. Glembotski, B. B. Rubin. 2003. MAP kinase kinase 6-p38 MAP kinase signaling cascade regulates cyclooxygenase-2 expression in cardiac myocytes in vitro and in vivo. Circ. Res. 92: 757-764. LaPointe, M. C., E. Isenovic. 1999. Interleukin-1β regulation of inducible nitric oxide synthase and cyclooxygenase-2 involves the p42/44 and p38 MAPK signaling pathways in cardiac myocytes. Hypertension 33: 276-282. Caivano, M., P. Cohen. 2000. Role of mitogen-activated protein kinase cascades in mediating lipopolysaccharide-stimulated induction of cyclooxygenase-2 and IL-1β in RAW264 macrophages. J. Immunol. 164: 3018-3025. Lo, C. J.. 2003. MAPK regulation of prostaglandin E2 production by lipopolysaccharide-stimulated macrophages is not dependent on nuclear factor κB. J. Surg. Res. 113: 189-194. Faour, W. H., A. Mancini, Q. W. He, J. A. Di Battista. 2003. T-cell-derived interleukin-17 regulates the level and stability of cyclooxygenase-2 (COX-2) mRNA through restricted activation of the p38 mitogen-activated protein kinase cascade: role of distal sequences in the 3′-untranslated region of COX-2 mRNA. J. Biol. Chem. 278: 26897-26907. Moran, J. M., M. A. Moxley, R. M. Buller, J. A. Corbett. 2005. Encephalomyocarditis virus induces PKR-independent mitogen-activated protein kinase activation in macrophages. J. Virol. 79: 10226-10236. Maggi, L. B., Jr, M. R. Heitmeier, D. Scheuner, R. J. Kaufman, R. M. Buller, J. A. Corbett. 2000. Potential role of PKR in double-stranded RNA-induced macrophage activation. EMBO J. 19: 3630-3638. Beckerman, K. P., H. W. Rogers, J. A. Corbett, R. D. Schreiber, M. L. McDaniel, E. R. Unanue. 1993. Release of nitric oxide during the T cell-independent pathway of macrophage activation: its role in resistance to Listeria monocytogenes. J. Immunol. 150: 888-895. Laemmli, U. K.. 1970. Cleavage of structural proteins during the assembly of the head of bacteriophage T4. Nature 227: 680-685. Heitmeier, M. R., A. L. Scarim, J. A. Corbett. 1997. Interferon-γ increases the sensitivity of islets of Langerhans for inducible nitric-oxide synthase expression induced by interleukin 1. J. Biol. Chem. 272: 13697-13704. Jobin, C., A. Panja, C. Hellerbrand, Y. Iimuro, J. Didonato, D. A. Brenner, R. B. Sartor. 1998. Inhibition of proinflammatory molecule production by adenovirus-mediated expression of a nuclear factor κB super-repressor in human intestinal epithelial cells. J. Immunol. 160: 410-418. Livak, K., T. Schmittgen. 2001. Analysis of relative gene expression data using real-time quantitative PCR and the 2(−ΔΔCT) method. Methods 25: 402-408. Hibbs, J. B. J., T.R. Vavrin, Z. Granger, D.L. Drapier, J.C. Amber, J.R. Lancaster, Jr. 1990. Synthesis of nitric oxide from a terminal guanidino nitrogen atom of L-arginine: a molecular mechanism regulating cellular proliferation that targets intracellular iron. H. E. Moncada, Jr, ed. Nitric Oxide from l-Arginine: A Bioregulatory System 189-223. Elsevier Science, New York. Matsumoto, M., K. Funami, H. Oshiumi, T. Seya. 2004. Toll-like receptor 3: a link between Toll-like receptor, interferon and viruses. Microbiol. Immunol. 48: 147-154. Iordanov, M. S., J. Wong, J. C. Bell, B. E. Magun. 2001. Activation of NF-κB by double-stranded RNA (dsRNA) in the absence of protein kinase R and RNase L demonstrates the existence of two separate dsRNA-triggered antiviral programs. Mol. Cell. Biol. 21: 61-72. Williams, B. R.. 1999. PKR; a sentinel kinase for cellular stress. Oncogene 18: 6112-6120. Yang, Y. L., L. F. Reis, J. Pavlovic, A. Aguzzi, R. Schafer, A. Kumar, B. R. Williams, M. Aguet, C. Weissmann. 1995. Deficient signaling in mice devoid of double-stranded RNA-dependent protein kinase. EMBO J. 14: 6095-6106. Blair, L. A., M. R. Heitmeier, A. L. Scarim, L. B. Maggi, Jr, J. A. Corbett. 2001. Double-stranded RNA-dependent protein kinase is not required for double-stranded RNA-induced nitric oxide synthase expression or nuclear factor-κB activation by islets. Diabetes 50: 283-290. Mogensen, T. H., S. R. Paludan. 2005. Reading the viral signature by Toll-like receptors and other pattern recognition receptors. J. Mol. Med. 83: 180-192. Funami, K., M. Matsumoto, H. Oshiumi, T. Akazawa, A. Yamamoto, T. Seya. 2004. The cytoplasmic ‘linker region’ in Toll-like receptor 3 controls receptor localization and signaling. Int. Immunol. 16: 1143-1154. Seya, T., K. Funami, M. Taniguchi, M. Matsumoto. 2005. Antibodies against human Toll-like receptors (TLRs): TLR distribution and localization in human dendritic cells. J. Endotoxin Res. 11: 369-374. Seth, R. B., L. Sun, C. K. Ea, Z. J. Chen. 2005. Identification and characterization of MAVS, a mitochondrial antiviral signaling protein that activates NF-κB and IRF 3. Cell 122: 669-682. Gitlin, L., W. Barchet, S. Gilfillan, M. Cella, B. Beutler, R. A. Flavell, M. S. Diamond, M. Colonna. 2006. Essential role of mda-5 in type I IFN responses to polyriboinosinic:polyribocytidylic acid and encephalomyocarditis picornavirus. Proc. Natl. Acad. Sci. USA 103: 8459-8464. Kang, D. C., R. V. Gopalkrishnan, L. Lin, A. Randolph, K. Valerie, S. Pestka, P. B. Fisher. 2004. Expression analysis and genomic characterization of human melanoma differentiation associated gene-5, mda-5: a novel type I interferon-responsive apoptosis-inducing gene. Oncogene 23: 1789-1800. Akira, S., S. Uematsu, O. Takeuchi. 2006. Pathogen recognition and innate immunity. Cell 124: 783-801. Sun, Q., L. Sun, H.-H. Liu, X. Chen, R. B. Seth, J. Forman, Z. J. Chen. 2006. The specific and essential role of MAVS in antiviral innate immune responses. Immunity 24: 633-642. Compton, T., E. A. Kurt-Jones, K. W. Boehme, J. Belko, E. Latz, D. T. Golenbock, R. W. Finberg. 2003. Human cytomegalovirus activates inflammatory cytokine responses via CD14 and Toll-like receptor 2. J. Virol. 77: 4588-4596. Compton, T.. 2004. Receptors and immune sensors: the complex entry path of human cytomegalovirus. Trends Cell Biol. 14: 5-8. Bieback, K., E. Lien, I. M. Klagge, E. Avota, J. Schneider-Schaulies, W. P. Duprex, H. Wagner, C. J. Kirschning, V. Ter Meulen, S. Schneider-Schaulies. 2002. Hemagglutinin protein of wild-type measles virus activates Toll-like receptor 2 signaling. J. Virol. 76: 8729-8736.